Peter basketted 60 pigeons for this race from Blois, distance for Peter 528,600 kilometres. He expected the pigeons, which had been liberated at 07h30, to arrive home between 14h00 and 14h30. At around 14h25 two pigeons arrived together from the right direction: one was from Peter and the other was from his uncle Piet, who lives next door. Peter clocked his “Miss Lucky” NL08-1545338 at 14h24.58. 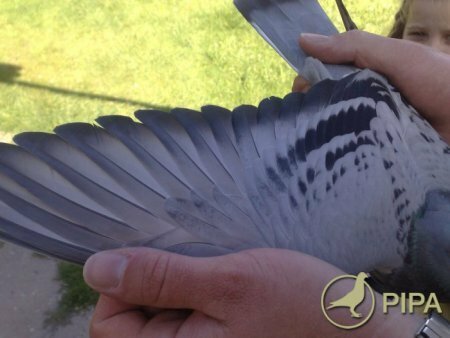 His uncle Piet clocked his pigeon at 14h24.57. In the reporting lists uncle Piet stood in first place. When the clocks were opened, it turned out that the clock from Peter was 1 second late. After being corrected, his clocking time was also 14h24.57. Seeing that the distance for uncle Piet is 528,588 kilometres, Peter was then the winner of this race. 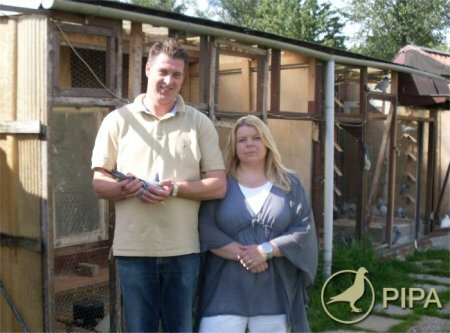 Nationally Peter had 45 of the 60 pigeons in the prizes! “Miss Lucky” is a chequered hen which was bred from “Pikeur” NL06-1073335 and “Gwen” NL01-5149744. “Miss Lucky” won seven prizes as a youngster. “Pikeur’s” parents are “Replay” NL04-2057095 (sort G. & C. Koopman via Marcel Sangers) and “Pretty Woman” NL00-2004151 (Comb. B EN W). 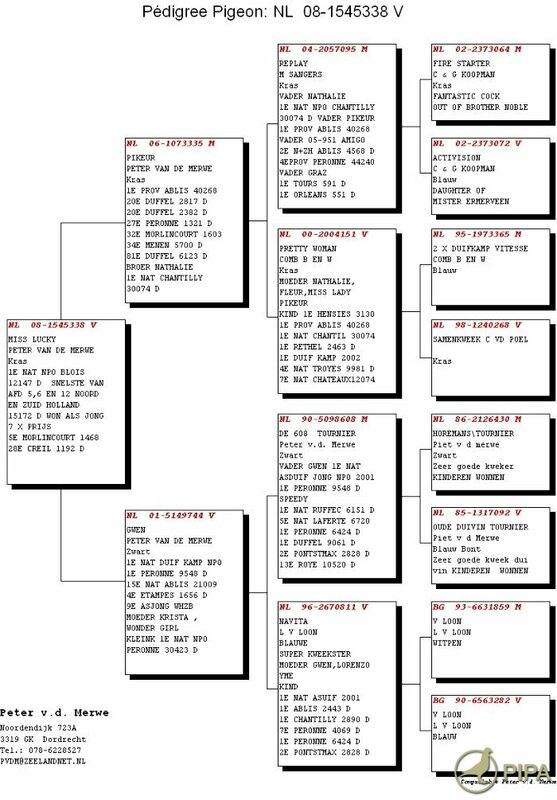 “Gwen’s” parents are “De 608 Tournier” and “Navita” (sort Louis van Loon). His sister Nathalie won 1st national Chantilly against 30.074 pigeons. The pigeons are raced in total widowhood, whereby the hens are shown before basketting. The showing lasts for half an hour to three quarters of an hour. The pigeons for the 1-day long distance races raced all the sprint and middle distance races as preparation. In-between two 1-day long distance races the pigeons also have a middle distance race. Peter coupled his pigeons at the beginning of March. They brooded on artificial eggs for about 25 days. Peter does this in order to delay the moulting and so that he doesn’t have to get rid of any young birds. He feeds the pigeons by instinct. He gives them the mixture from Versele Laga: at the beginning of the week Gerry Plus and then racing mixture Champion. In addition to this feed the pigeons are given the usual by-products (a.o. Teurlings) and also nibbling seeds. Peter has tried to give his pigeons peanuts, but they won’t eat them so he doesn’t try anymore. The pigeons are given a Paratyphus cure in the autumn. A cure for tricho is only given when necessary. This season they have just had a cure against tricho from BelgaMagix. In addition they are preventively treated every three weeks against tricho with medicine from the veterinary surgeon Vincent Schroeder. Strombeek against 4.890 pigeons 3, 4, 7,14,70 etc. Strombeek against 2.092 pigeons 3, 9, 10, 11,27, 29, 31, 32, 34, 35, 39, 40, 41, 47, 48, 52, etc. Peronne against 5.522 pigeons 5, 6, 34, 35, 54, 56, etc. Orleans against 2.900 pigeons 3, 6, 12, 15, 29, 36, 37, 38, 40, 46, 52, 72, 73, 80, 82, 88, etc. St. Quentin against 1.149 pigeons 1, 5, 10, 23, 26, 29, 36, 40, 41, 42, 51, 55, etc. Chalon and Champagne against 3.467 pigeons 3, 10, 14, 30, 31, 34, 41, 66, etc. Orleans against 1.631 pigeons 2, 11, 17, 23, 44, etc. Strombeek against 2.259 pigeons 4, 7, 16, 27, 66, 103,etc. 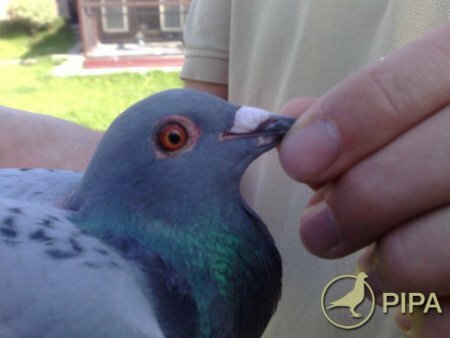 Blois against 1.731 pigeons 1, 4, 11, 13, 14, 15, 190, 21, 22, 29, 32, 35, 37, 39, 41, etc. Peter, on behalf of all the workers and readers of PiPa, warm felt congratulations on this magnificent performance from Blois, but also on the other excellent results.